Hi, my name is Arisa! Currently based in Tokyo, I’m raising 3 young children (6, 4, and 2) together with my French-Algerian husband. Born and raised in Hokkaido, Japan, I’ve lived in New York, Costa Rica, Tokyo, and Hong Kong. Two of our children were born in Hong Kong, and we moved back to Tokyo when I was pregnant with our youngest. What I enjoy in Tokyo are definitely the safety, the beautiful four seasons, and the food! Tokyo offers stunning cherry blossoms in spring and beautiful colorful autumn leaves in fall. Even during winter, we have a clear blue sky most of the time. Summer is my least favorite season here as it’s hot and humid. Luckily, there are so many places to escape to outside the city. 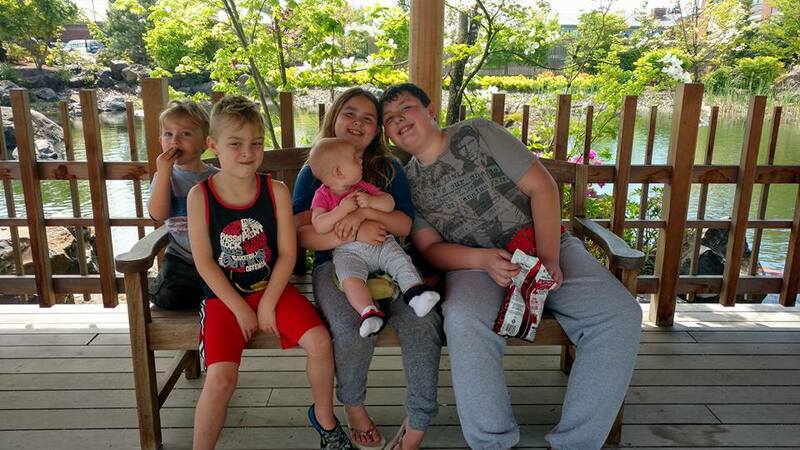 Join us to see what our typical Sunday with 3 kids in Tokyo looks like! Our kids usually wake up around 7:30AM and play by themselves until we get up around 8AM. As our older ones must be on the school bus at 7:50AM on weekdays, we are definitely more relaxed on weekends. Luckily, our 6-year-old daughter is wonderful with her little sister. She’s the one who gives her her morning milk while we’re still in bed. I love spending time with the kids in the kitchen. As soon as I get up, we prepare breakfast all together. This morning, my daughter helped me make hot chocolate and cut up fruit while I made coffee and toasted the baguette. Meanwhile, my 4-year-old son set the table. The kids are definitely French when it comes to breakfast. They love their baguette with butter or jam, croissants, or pain au chocolat. I bike my 6- and 4-year-olds to soccer on Sunday mornings instead of driving which is what we usually do in Tokyo to avoid the hassle of taking public transportation with three energetic kids. The bicycles equipped with two child seats are definitely a game-changer if we want to go somewhere close, but not close enough for the kids to take their own bikes or scooters. My husband also has a bike with a rear child seat. My 2-year-old goes to the playground while her sister and brother are busy at soccer. Lunch Burger Mania is our go-to restaurant on Sundays after soccer. We usually have burgers while the older kids stick to grilled chicken sandwiches, and our youngest enjoys meatballs with cheese sauce. When the weather is nice, we stop by Baskin-Robbins for ice cream which we eat at Arisugawa Park on our way home. Since my youngest daughter still needs an afternoon nap, we come home after lunch for nap time. The older ones have quiet time for playing or reading. My 6-year-old also does his homework. We have goûter (afternoon snack) when my youngest wakes up. It’s then either movie time or playtime at home; or we go to the park. As the weather was really nice today, we went to Robot Park which is close to home. Since the kids wanted sushi for dinner, we went to a neighborhood restaurant. I’m quite picky about where I go for sushi in Tokyo. I’m spoiled since I come from Japan’s northernmost region which is renowned for its superb seafood. Pintokona in Tokyo does, however, fit the bill. It’s a family-friendly restaurant with semi-private tables where they serve excellent-quality fresh sushi. My kids enjoy helping themselves from the restaurant’s conveyer belt! After we get home, the kids have their baths and we all hang out in the reading room until bedtime. I love this end-of-day ritual when we read stories or sometimes just talk about superheroes. As my older kids have to get up early for school the next day, we finish up reading and get ready for bedtime around 8PM. Although it’s definitely total chaos dealing with three kids on weekends, we thoroughly enjoy our wonderful Sundays together. Need more Tokyo information? Don’t forget to check out our Tokyo Destination Guide as well as our Interactive Tokyo Trails! Arisa is a Japanese mother of 3 and blogger at https://travelholicmama.com. she grew up in Hokkaido, lived in New York, Costa Rica and Hong Kong, and more recently, has been calling Tokyo home. She has been to 30+ countries, and with children they have traveled to 20 countries (and counting! ).